Comprehensive grammar, spelling, punctuation, structure and style checkers. Don’t let languages be a barrier! Now you can understand them all with one easy click! Translate full texts from any application in one click. 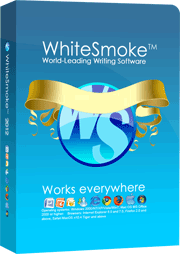 WhiteSmoke is the ultimate language solution for full text translation and perfect English writing. With algorithms based on artificial intelligence and natural language processing technology, your writing couldn’t be in better hands. Never at a loss for words! Hundreds of professional letter templates to choose from.